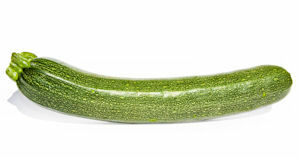 Zucchini is one of those vegetables that I wish was available locally all year long. Sadly, its stay is much shorter than that, and it is a vegetable that doesn’t freeze well whole. So, while zucchini is available I like to cook with it frequently. I have served zucchini in numerous forms: zucchini cakes (both as a savory appetizer and as a sweet dessert), grilled zucchini, mashed zucchini, and stuffed zucchini. That is just the beginning of the list. One item that I had not made previous to last week’s Tapas Monday was Zucchini Fries. However, it seemed like the perfect dish to add to our menu, as it was a finger food and relatively light for the summer. I was suspicious as to how successful this recipe would be. Zucchini, in my experience, tends to become mushy with heat. Plus, I have had mixed results with making oven-baked fries. Regardless, I like trying new recipes, and my husband isn’t finicky, so it seemed worth a try. The excellent news is that the zucchini fries were delicious! The breading had a delightfully crunchy texture, which paired well with the tender filling. While the zucchini technically may have been mushy, the crisp coating seemed to balance it so well, that it appeared to have more of a tender quality. The only change I would make is to create a dipping sauce that is more exciting than ketchup. With a month or two of zucchini season ahead of us, I am sure we will be making these again. Cut each half into matchsticks that are no more than 1/2″ x 1/2″ wide. Pour flour into a shallow dish, and season with salt and pepper. Crack egg into another shallow bowl, and whisk.Blend sandwich thin (or other bread) to create breadcrumbs, and pour into a third shallow bowl. Add basil to breadcrumbs.Dip each zucchini strip into the flour, coating all sides; then dip into egg; then dip into bread crumbs. Place coated zucchini strips on baking tray. Return to oven for an additional 10 minutes.Eat immediately.